It is 1898 in the Azores, nine forgotten islands of magic, mystery and mythology. 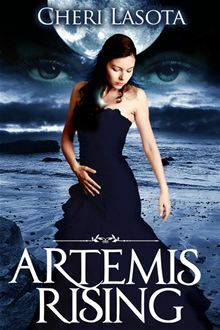 Since birth, Azorean Eva Maré has been fated to take on the name and tragic life of Arethusa, a Greek nymph who is turned to water after the river god Alpheus falls in love with her. But when she accepts her new name she learns at once that the river god she is to give herself to is none other than Diogo, the son of a rich ship owner, and his obsession for Eva is frightening. When Eva is rescued by Tristan, an Azorean orphan, she finds herself drawn to him despite the overwhelming obstacles between them. But Tristan has a destiny of his own, one that leads him toward another girl, another life, and another tragic end. Will Eva reach Tristan before he loses his life to a cruel twist of fate? Will Tristan save Eva from a fate worse than death at the hand of Diogo? Destined to be with Diogo yet hoping against hope that she will win Tristan's love, Eva must somehow choose between them, or fate will choose for her. Artemis Rising was a 10-year labor of love inspired by a magical stay on Terceira Island in the Portuguese Azores Islands. My unfailing love for these islands and the Azorean people was the catalyst that brought this complex story of fate and belief to life. An E-book Category Finalist in the 2012 Next Generation Indie Book Awards, this YA Historical Fantasy novel is for readers who loved Chelsea Fine's Archers of Avalon series, Megg Jensen's Anathema, and Addison Moore's Celestra series. Aretemis Rising is a magical young adult novel about destiny and love. Set in the Azores in the late 19th century, young Eva Mare’s mother performs a pagan ritual to look into her daughter’s future. During her trance, she sees a man named Diogo and convinces Eva he is to be her destiny. But Eva encounters a young man of her own named Tristan who also faces a complex destiny. It is Tristan she falls in love with and it is Diogo who she disdains for his evilness. And thus begins a masterfully woven plot filled with conflict and danger and intrigue. Cheri Lasota has written a spell-binding historical fantasy about young, passionate love, skillfully tying it in with historical myths such as Tristan and Isolde and Arethusa and Alpheus. Although the novel is written for young adults, the story has a great deal of depth and is more than adequate for adults. It is a coming of age novel about self-discovery, about one’s true faith, and of triumph. A compelling read and highly recommended.